Our site has been at UConn a long time—since 1982. As an undergraduate, I was a student of then-director Mary Mackley’s during the 1991-92 academic year, while I was attending the Teacher Certification Program for College Graduates. Later, still early in my teaching career, I attended the summer institute (SI) at UConn in 1999. Mary retired just five years after that. How I came to be director is unusual in its own right. I completed my PhD at UConn in December 2006, but since I was still teaching high school, as was my wife, we had no intention of leaving the area. But that winter the position of Writing Project Director opened up. During my April break, my colleague Kelly Andrews-Babcock and I were conducting interviews of teachers for the SI when I had to excuse myself to attend my own interview for the director’s position. I was hired in May. The high school year ended in June and then the SI began. By August 1, I was officially the Director. So I bought this journal a few weeks ago, knowing I needed a place to begin my writing journal. I read the fact we have to bring our writing in copies to share on the first day. As if I am going to be a “real writer” now, not just someone who loves it, teaches it, and motivates kids and other teachers to explore ways to incorporate it everywhere into their world. I’ve avoided becoming part of the writing project for years. I wasn’t sure I had anything to say, to add to the conversation. I’m not sure I do now. But at the very last minute I submitted my application. Then to my surprise I got the interview, and then accepted. I got up at 5:30 am this morning determined not to be late- and I wasn’t. Determined not to get lost, only a little, and here I sit in a circle of writers. Of real writers. Teachers who have been around longer, shorter than I. I come feeling excited and hesitant at the same time. So many goals, both personal and professional. I parked on the 6th floor of the Gilman Parking Structure, with a student pass. It’s been a long time since I have been a college student. My inquiry for the Western Massachusetts Writing Project (WMWP) summer institute in 1994 focused on the differences for young people in composing with computers—a novelty at that time—rather than on paper. I helped plan and facilitate some of the first nationally organized professional development in our network related to digital literacies. 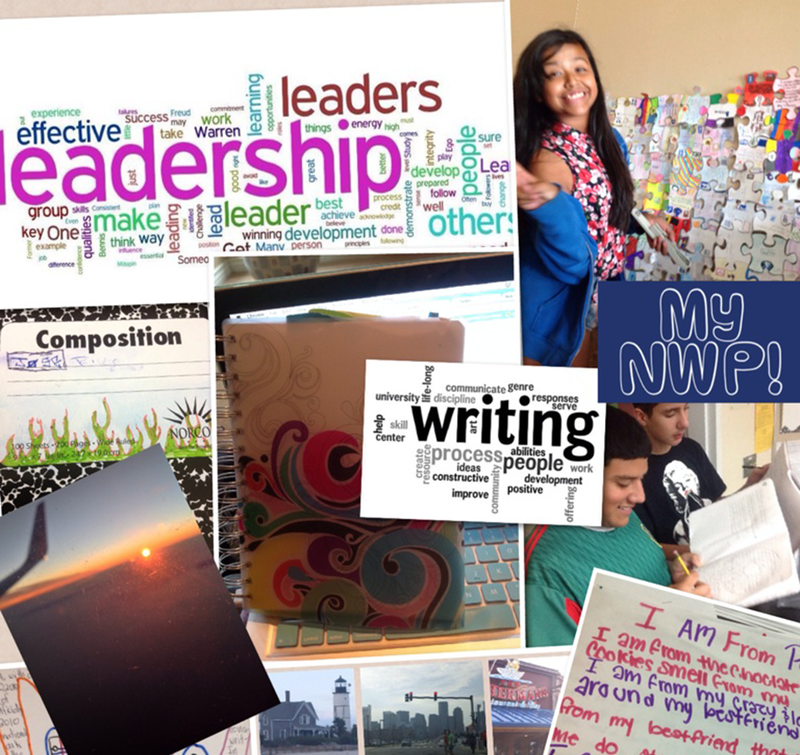 I’ve blogged, built web-based communities, tweeted, and led online webinars, all as part of my work for the National Writing Project. I’ve got in my pockets, literally and figuratively, a bunch of gadgets, and I use them all for purposes of exploration and writing, experimentation and documentation. Yet the most powerful tool I’ve encountered over my years of work as a Writing Project educator is not digital. Or at least not necessarily digital. That tool is the invitation. Early on a Friday morning I awoke at my home in Connecticut, knowing I wouldn’t be returning back there until I had learned something. and took a trip down south to expand my ever-growing knowledge of the teaching profession. As the school year closes, I begin the task of having my students do the meta. I see you nodding your head. Yes, we should all require our students to do the meta; the act of reflecting and analyzing one’s learning and thinking processes—metacognition. Here’s the rub: my students are third graders. Enough said! But, do the meta I do. Each year, the children in my school are required to write a letter to their future teacher, an introduction. I take it a step further and require the kids to introduce themselves as readers, writers, mathematicians, and learners. This year was no exception, but the responses were not what I expected. Two factors delayed my initiation into the National Writing Project: I never wanted to be a teacher; I am not a joiner. When I was a kid, the teachers I had didn’t seem to be enjoying themselves. I remember a strong emphasis on discipline, on sitting up straight and paying attention, on making the most of your time because school was so important. Teachers knew things. They had emerged from the grind into positions of ever-vigilant authority. Teachers were taskmasters: they put us through our paces, kept us in line, kept the line straight…. Teaching looked so serious. An organization of teachers sounded downright oppressive. When I finally came to my senses, concluded that my athletic skills would not carry me to the big leagues, that my verbal skills were no guarantee of a best seller, when I realized that I had to make a living (! ), teaching turned out to be more enjoyable than I ever imagined. I thought teachers had to have the answers, but that was a mistake. When I started teaching I learned to value good questions. If I came with curiosity, shared it with the group, invited them to ask questions, too, school could be pretty engaging. NWP is Family: Now I am home! For over thirty years now, I’ve regarded the National Writing Project as a family—as my professional family. Just like families, we engage together, go separate ways, but when we come back together we take up where we left off, our shared experiences of doing significant work together bonding us, but also leading us into shared futures in often surprising ways. The NWP has been the best kind of family to me. A family that wants everyone to be involved, welcomed and to become their best possible selves. Being there when needed, but celebrating your journey when you are off on your own, and always there to welcome you back. It’s a family that gives you a home, but more than that, helps you to find your own home in the world. It’s hard to believe that my career-long involvement with the writing project began with a wild (and unusual) urge to take a road trip! Way back in 1991 we had just gotten our first minivan—the perfect vehicle for a family with two little boys—and even though my husband had to work, I was itching for a trip. Somehow I managed to talk my dad into coming with me and two boys under 6, and driving the length of the state of California to visit my sister. So what does this have to do with the Writing Project? Well, it so happens that my sister was attending the Area 3 Writing Project Invitational Summer Institute at UC Davis…and she invited me to come with her for a couple of mornings, if I could talk my dad into watching his grandsons. And for those two mornings while I discovered compelling professional development in typical Writing Project fashion, my father fed my sons popsicles for breakfast at the local country store, taught them to crawl in and out the window of my sister’s Datsun (rather than use the door), and who knows what else…he probably taught them to spit too! And it was totally worth it. Like many other November days in Michigan, I remember it being cold, wet, and windy. This was not uncommon for my birthday, which in years past had seen everything from glorious fall sunshine to a few inches of snow. This particular afternoon, I was finishing up at the gas station and preparing to pick my children up from school when my phone buzzed. Not a number I recognized, but it was identified as coming from California. As I answered, I was trying to put the pieces into place, wondering who might be trying to get in touch with me. I was in my second year at Central Michigan University, having made the successful leap from graduate student and co-director of the Red Cedar Writing Project at Michigan State University to be a newly minted assistant professor of English. At the time, I had been working on a few projects with other NWP colleagues, including early drafts of Because Digital Writing Matters with Elyse Eidman-Aadahl and Danielle DeVoss. Perhaps Elyse was trying to get in touch with me from her office? No, doesn’t come close. Okay, who is my audience? Is it young teachers entering the profession, floundering as I once did? Feeling overwhelmed, small, under a microscope, everyone expecting that college and student teaching has created a professional who knows the answers, but finding that it’s not as easy as it looks, and that these eager or bored or angry or sad or hurting or confused faces cannot be fooled; they know when you are confident and when you are uncertain, and they crave your certainty, your control, they want you to have all the answers, to make it easy for them, and ultimately you learn you’re all in the same boat, learning together, but the lessons are painful and lead to sleepless nights.